When you’ve made the decision that an elective surgery like a hip replacement or total knee replacement or will reduce your daily pain and improve your quality of life, you might be aware that post-surgery, you’ll need to take part in an inpatient rehabilitation program to ensure you recover to the fullest extent. However, did you know that the better shape you’re in physically before your surgery, the easier the recovery period may be? Recent studies have shown that physical therapy before the surgery can diminish the need for postoperative care by almost 30 percent. This is known as prehabilitation, in which you attend outpatient therapy and make the proper lifestyle adjustments to ensure you’re as fit as possible before your surgery date. Think of prehabilitation as a way to kickstart the healing process following surgery so you can get back to the level of independence you’re accustomed to sooner. Prehabilitation can not only allow you to get in better physical condition before surgery and help you heal faster but as mentioned previously, it can also decrease the amount of rehabilitation you’ll need following a procedure. In fact, Arthritis Today reported that pre-surgery exercises reduced the need for post-surgery inpatient rehab by up to 73 percent. Seniors who make exercise part of their daily routines experience a wide variety of physical, emotional and mental health benefits. Exercise helps keep your muscles and bones strong, keeping you steadier on your feet and reducing the likelihood of falling. Plus, aerobic activity increases your heart rate, which helps pump more oxygen to your brain and releases those feel-good hormones like serotonin and endorphins. It also releases a variety of hormones in the brain that promote new cell growth to help improve your memory and cognition. Before undergoing an elective surgery, it’s vital that your body is in the best physical shape possible. When your muscles, bones, and joints are in the best condition, it minimizes your risk of losing muscle mass and stiffening joints after the operation. Participating in outpatient physical therapy before your procedure will allow you to return to the lifestyle you’re accustomed to at a much faster pace. Your recovery period will be greatly enhanced, as your muscles are already strengthened and ready to support your new and improved joint. Exercise will also improve your circulation, as well as possibly help reduce swelling and the risk of blood clots post-surgery. 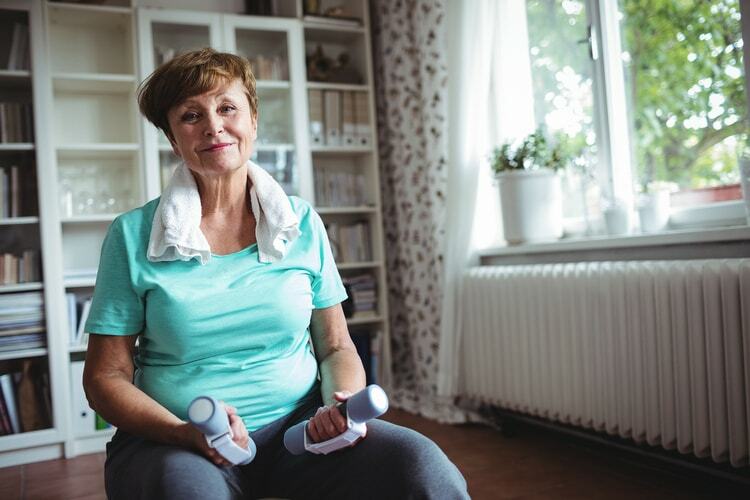 If you’re new to the fitness world, make sure to talk to your doctor or therapist about any physical limitations you may have before you get started. Also, listen to your body when you do the exercises they prescribe. If you experience any pain, or the exercise is causing discomfort to your joints, stop the activity immediately and contact your physician. Peabody’s Rehab to Home program helps you get back to living life on your own terms faster. Our physical, occupational, speech and aquatic therapy services are available seven days a week, focusing on restoring health to both older adults and seniors alike. For more information about our inpatient rehabilitation center, please contact us today by calling (260) 982-8616.